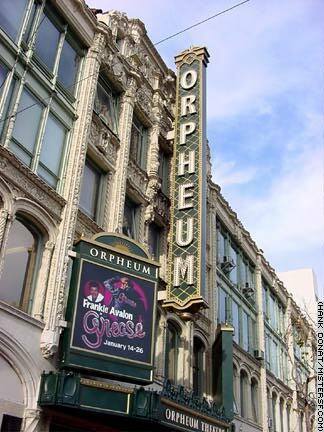 Orpheum Theatre, 1192 Market Street. Detail II This building on the northwest corner of Laguna and Hayes Streets was built in the 1880s by Colonel Michael Hayes to serve as an amusement pavilion, which Hayes hoped would attract traffic and lead to the extension of a streetcar line here. In Erich Von Stroheim's 1925 silent masterpiece Greed, the property at 611 Laguna stands in for 611 Polk Street, the office of McTeague, a dentist. Based on the novel McTeague by San Franciscan Frank Norris, Greed takes place mostly in Polk Gulch. Norris grew up on Van Ness Avenue and used Polk Gulch locations in the novel to brilliant effect in capturing the blue collar character of the neighborhood at the end of the 19th Century. The structures at the actual Polk locations had not survived the 1906 Earthquake as those on Laguna had, and in 1925 were, according to perfectionist Von Stroheim, too modern to play themselves. (Norris' book was written in 1899.) Von Stroheim insisted on using locations named in Norris' novel such as the Orpheum Theatre, Cliff House, and St. Paulus Evangelical Lutheran Church in San Francisco, and the Oakland train depot, Placer County, and Death Valley elsewhere. Greed is the subject of much fascination in cinema history. Von Stroheim's epic character study was originally nine hours long. The studio, MGM, cut the film to commercial length. The result is a 2 and-a-quarter hour Cliff's Notes version of Von Stroheim's vision, yet it's still considered by many to be among the greatest films ever made. Greed depicts the undoing of McTeague (Gibson Gowland), his bride (Zasu Pitts), and friend Marcus (Jean Hersholt) that starts when the Pitts character wins the lottery after throwing Marcus over for McTeague.